Mulch groundcover of all kinds brings a different type of reoccurring maintenance cost. 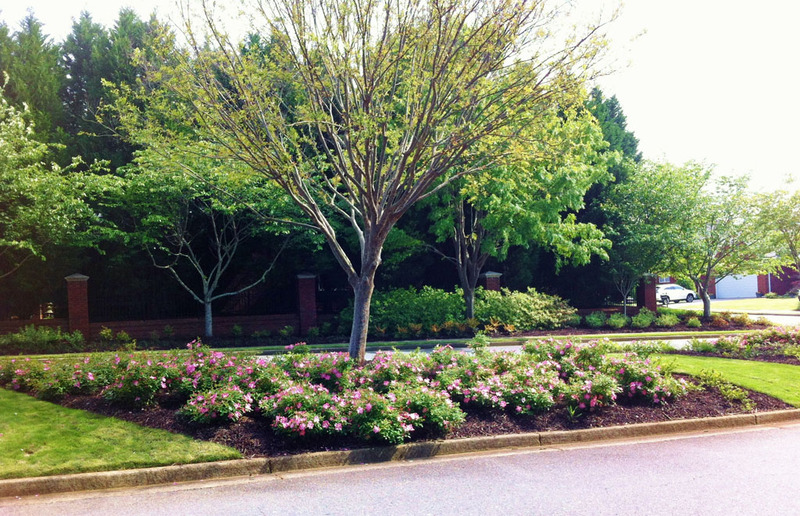 The initial cost of installing mulch is much more expensive than that of pine straw. Mulch also decomposes at a slower rate and creates a problem if you keep refreshing it by adding more mulch once or twice a year because if the level of mulch builds up too much it will suffocate your vegetation. Therefore, in order to bring the color back to your mulch beds, most often property owners are forced to remove all mulch and completely replace it with new. So, year after year they are burdened with the same initial cost, but also must pay to get rid of their existing mulch. Using a topical colorant, you can generally save 50%-75% of the cost of applying new mulch on a yearly basis by just coloring the mulch already in your bed. In addition to coloring existing mulch, GCS can provide colored hardwood mulch. GCS can topically color existing mulch for $15 per cubic yard, saving the client $50 per cubic yard. Because mulch does not decompose as quickly as pine straw, you can color most wood fiber mulches up to 5 times! Each time the colorant will last 6-9 months.